Golf course superintendents, pros and golfers alike have a new weapon for their ball mark and brown spot repair arsenal – the jabAERATOR, a “patented” product of Felmar Products LLC (Boca Raton, FL). The tool features a sleek, ergonomic design that makes it universally easy to use by all and eliminates the need to bend down to repair ball marks. In application, users simply place the jabAERATOR over the ball mark, step on the base which releases 16 pins designed to flatten, lift and aerate the depression, while allowing water to regenerate the turf. Strategically placed along the course, in golf bags or golf carts, the jabAERATOR will be a tool golfers will be inclined to pick up because it is so easy to use. As for its lifespan, the jabAERATOR is built of durable stainless steel and anodized aluminum to promote long, reliable performance. The jabAERATOR is 29 inches long, with a 4-inch base diameter and weighs just 3.7 lbs. 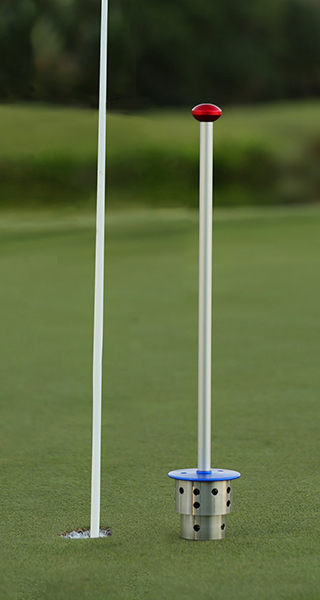 According to industry data, the average number of ball marks made on greens per round is eight per golfer. Using the example of 130 rounds played each day on a course, it would receive 1,040 ball marks daily or 31,000 per month and over 374,000 annually. Ball marks left unattended not only interfere with golfers’ putts, but also result in unsightly brown spots. Repairing ball marks and brown spots is a costly, labor-intensive process when left unattended. The jabAERATOR is a tool designed to address this ongoing challenge for golf course superintendents and pros.